Giving evidence to MPs on a House of Commons select committee is not usually part of Karla Wilson-Palmer’s job, but the opportunity was one she relished. ‘As a nurse working on the front line, it was good to tell politicians about what I do and what it means to service users and the police,’ she says. The mental health nurse leads the Devon street triage pilot, a project run by Devon Partnership NHS Trust. It aims to support the police in dealing with people thought to be experiencing a mental health crisis, and help them access mental health services. When the RCN was asked to give evidence to the home affairs select committee inquiry into police and mental health, the college in turn asked Ms Wilson-Palmer if she would tell MPs about her service. ‘I didn’t know what a select committee was, but the RCN supported me,’ she says. On the morning of the hearing in London, Ms Wilson-Palmer met the RCN’s adviser on criminal justice Ann Norman and parliamentary officer Lizzie Dowd, who talked her through what to expect. ‘They gave me a list of questions I was likely to be asked and told me that if I could not answer a question to say so and refer them to the RCN, which would give them the information at a later date. When the then minister for care and support, Norman Lamb, attended a later select committee hearing, a committee member referred to Ms Wilson-Palmer’s evidence that her service operated only four nights a week, and asked the minister how funding could be secured to extend it. Ms Wilson-Palmer advises any nurse invited to give evidence to seize the opportunity. ‘It is not as daunting as it might seem and you get support from, say, the RCN. It was less formal than I expected and the MPs are a friendly bunch. And remember, you know your subject really well or you wouldn’t have been asked to attend’. Each government department has a House of Commons select committee that examines its spending, policies and administration. Committees choose the subject of their inquiries and gather evidence from interested organisations and individuals in writing and/or call for experts such as Ms Wilson-Palmer to appear in person. 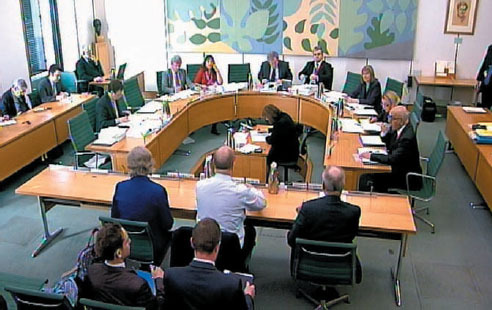 The committee’s findings and recommendations are reported to the Commons and published.